Last week, Council President Dave Fleisher and Council members Susan Shin Angulo and JIm Bannar helped kick off the year's biggest swimming event, Cherry Bowl 2013, at the Wexford Leas Swim Club! 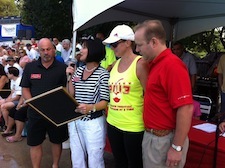 This year's event, in it's 54th year, featured dozens of swimmers from each of our local clubs. In the end, the swimmers from Covered Bridge emerged victorious. Nevertheless, it was a great day for all involved. Congratulations to Covered Bridge on its big win, and congratulations to Wexford Leas' members, executive board and the Cherry Bowl planning committee on carrying out a wonderful event! The Camden County Mosquito Commission is spraying for mosquitoes throughout the summer in Cherry Hill. This week, the commission sprayed in Ashland, Barclay, Erlton North, Kingston, Kings Croft, Windsor Park and Woodcrest. The spray is not harmful to humans and pets, but those who are sensitive to irritants or have respiratory concerns should avoid direct contact. The Commission sprays in neighborhoods and open spaces, but will not spray on private property. Residents can curb the growth of mosquito populations by checking their properties for sources of standing water, such as swimming pools, trash can lids and other containers. Click here for more information on the sprayings and mosquito prevention. For further information or to report a problem, contact the Mosquito Commission at (856) 566-2945 or skeeters@camdencounty.com. 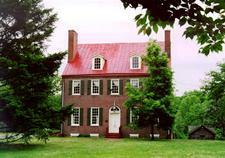 Dive into Cherry Hill’s history with a visit to our historic Barclay Farmstead this weekend. The Farmstead will be open from noon to 4 p.m. this Sunday for free guided tours of the 19th-century Quaker farmhouse and much more. From 1 to 3 p.m., visitors will see demonstrations of wooden toy-making, and have a chance to make their own whirligigs! While you’re there, walk on the surrounding nature trails and enjoy the playground and 32 acres of park land. Can't make it this weekend? The farmhouse is open for public tours the first Sunday of every month through November. For more information, call (856) 795-6225 or e-mail info@barclayfarmstead.org. 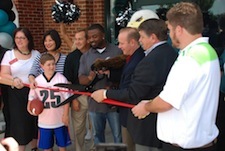 Last Saturday, Council President David Fleisher and Council members Susan Shin Angulo and Melinda Kane attended the grand opening of the Philadelphia Eagles Pro Shop in the Market Place at Garden State Park. The store features all the latest styles of Eagles merchandise, and is a welcome addition to our community. Our Council members proudly represented the Township alongside Eagles' mascot Swoop, Eagles Cheerleaders, and former Eagle Brian Westbrook. As Council President Fleisher said: "Today makes official what we've known for a long time. Cherry Hill is Eagles Country!" Starting Aug. 1, the Animal Welfare Association (AWA) will offer free spay and neuter surgeries for cats of Cherry Hill residents. The only requirement is proof of residency in the Township. Stray and feral cats from Cherry Hill can also receive the surgeries, which include a free rabies vaccine. Cats in Bellmawr, Gloucester Township and Lindenwold are eligible for the surgeries as well. The program aims to reduce the number of homeless cats in the Township and in local animal shelters. For more information, click here, call (856) 424-2288 ext. 105 or email clinic@awanj.org. Summer reading fun continues at the Cherry Hill Public Library! CHPL invites you to attend “Mad Science Wacky Science” on Monday, Aug. 5 from 6:30 to 7:30 p.m. in the Conference Center on the lower level. Science will spark your curiosity and attendees will be amazed by exciting experiments! This free program is for ages 4 and up (and adults, too!) Don’t forget to mark your calendars for the End of Summer Carnival on Aug. 22 from 4 p.m. to 7 p.m. Visit www.chplnj.org for more information. The Cherry Hill Public Library will host a Red Cross community blood drive on Tuesday, Aug. 13 from 2 p.m. to 7 p.m. in the Conference Center on the lower level of the library. Blood shortages are occurring all across our region and every two seconds someone needs you. All presenting donors will receive a coupon for a Free Dunkin Donuts Iced Coffee and Donut. Appointments are available every 15 minutes. Click here to make an appointment online. neighborhoods and open spaces, but will not spray on private property. Commission at (856) 566-2945 or skeeters@camdencounty.com [mailto:skeeters@camdencounty.com] . Farmstead this weekend. The Farmstead will be open from noon to 4 p.m.
795-6225 or e-mail info@barclayfarmstead.org [mailto:info@barclayfarmstead.org] . Starting Aug. 1, the Animal Welfare Association (AWA) will offer free spay and neuter surgeries for cats of Cherry Hill residents. The only requirement is proof of residency in the Township. Stray and feral cats from Cherry Hill can also receive the surgeries, which include a free rabies vaccine. Cats in Bellmawr, Gloucester Township and Lindenwold are eligible for the surgeries as well. The program aims to reduce the number of homeless cats in the Township and in local animal shelters. For more information, click here, call (856) 424-2288 ext. 105 or email clinic@awanj.org [mailto:clinic@awanj.org] . 6:30 to 7:30 p.m. in the Conference Center on the lower level. www.chplnj.org [https://outlook.chtownship.com/owa/redir.aspx?C=6eb5ab5cca604c5a906d65cad792dd67&URL=http%3a%2f%2fwww.chplnj.org] for more information. The Cherry Hill Public Library will host a Red Cross community blood drive on Tuesday, Aug. 13 from 2 p.m. to 7 p.m. in the Conference Center on the lower level of the library. Blood shortages are occurring all across our region and every two seconds someone needs you. All presenting donors will receive a coupon for a Free Dunkin Donuts Iced Coffee and Donut. Appointments are available every 15 minutes. Click here [http://www.redcrossblood.org/make-donation-sponsor?date[min][date]=&date[max][date]=&field_sponsor_code_value=cherry%20hill%20library] to make an appointment online.